Most of the information in this handbook was later included in Taiyin Daquanji, translations from which are linked from here. It is the third such handbook discussed in this article by Tong Kin-Woon. In the collection of the Beijing Library, (this is) a printed volume from the Ming dynasty; the editor and selector's name is not given. This book should have two folios, but now there is only a fragmentary edition with the first folio. At the front there is no preface. According to what Zhu Quan wrote in his preface, dated 1413, to Xinkan Taiyin Daquanji, Taigu Yiyin was originally compiled by Tian Zhiweng of the Song dynasty, and he counted three folios. During the Southern Song Jiading reign (1208-25), Yang Zuyun changed the name (of Tian Zhiweng's book) to Qinyuan Xuzhi, and presented this to the imperial court. During the Ming dynasty Yongle reign (1403-25) Zhu Quan obtained this at Tuyang.4 Later, arriving in the Jiangxi region,5 based on various different editions he had obtained, he made corrections, "removing the useless parts, patching up the missing parts, arranging it as two folios, and calling it Taigu Yiyin." The present fragmentary Taigu Yiyin, as luck would have it, also has two folios; and the heading "Ten Friends of the Qin Hall" doesn't have the words Emaciated Immortal in front.6 If you look from the standpoint of these two items, this (later) book was perhaps a revised edition by Zhu Quan. However, the style of this editor was not very rigorous. For example, between the sections "Structure of the underside of a qin" and "The basic nature of a qin gives rise to certain shapes" for no good reason there is the insertion of a segment with finger technique material of (Tang) Zhao Yeli;7 this segment is not in the table of contents. It is hard to believe that this sort of disorderly and unsystematic method could come from the hand of the famous scholar Zhu Quan. According to Yuan Junzhe's "Summary introduction to Taiyin Daquanji",8 when he discusses the mother editions he used as a basis, he also only says, "The current day's so-called Taigu Yiyin collection", and doesn't say the editor of (his? any?) Ming edition was Zhu Quan. From this one can infer that perhaps this book came from the booktrader's own hands. The valuable point of this book is that it is the oldest surviving edition of Taigu Yiyin. From looking at its table of contents, (the complete volume would) preserve not a few long-lost qin writings and qin tablature from the Tang and Song dynasties. See for example such qin pieces as Golden Oriole Intonation, which is in Shilin Guangji; the recording of 22 segments in the left hand section of "Diagrams (explanations?) of Hand Signs"; and so forth.9 For researching the origin and development of the book Taiyin Daquanji, and for determining the validity of historical materials, these all have relatively important value. 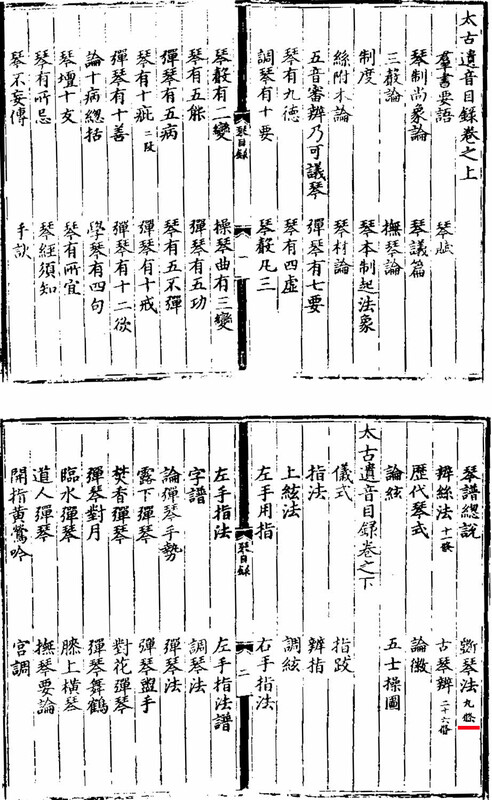 The edition here has a complete table of contents but the book itself is not complete: it ends after four of the nine-subsections of "斵琴法 Zhuo Qin Fa" (see the red mark in the image, at top. As an indication of how the differing editions of this book had differing arrangements of this material, note that this 斵琴法 Zhuo Qin Fa appears at the beginning of Taiyin Daquanji, where it is called 造琴法度 Zao Qin Fadu.